We're your dental practice's best line of IT defense. An IT ninja is somewhat of an anomaly. You're busy with patient care, so let's preface concisely and then get to the point. Every IT provider in town rambles on about how they're different. Distinctive. How they truly break the mold. You've heard it a thousand times. The truth? You're likely to get a condescending nerd with a head packed to the brim with a sordid combination of superiority complex and Harry Potter lore. Those aren't IT ninjas. We are. The IT ninja thinks outside the box. He prides himself in disregarding conventional thinking processes and is quick to find a better solution. He is in several places at once, handling multiple client issues at once. The IT ninja is exceptionally responsive, understanding that a down system can't wait until the next business day to get back online. The IT ninja puts out fires. He follows up. He communicates with his clients as often as necessary. You know that you get what you pay for. We're not the cheapest in town, but we're not the most expensive, either. We get it done, and done the right way. It's of utmost priority to us to effectively and efficiently diagnose your technology issues and resolve them entirely. You've got work to do and patients to see; there's no time to mess around or make three calls for the same problem. 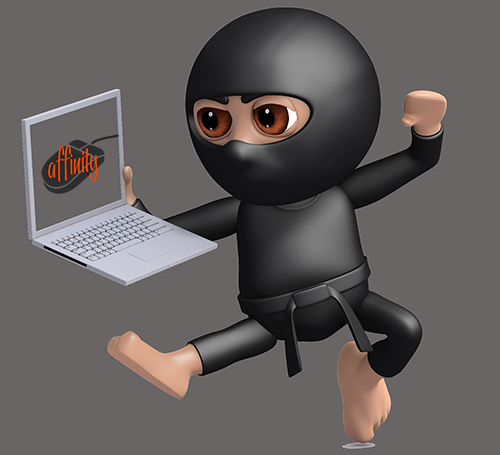 Affinity is the IT ninja's true home. We are not a typical IT support company. We understand that the real problem is your frustration with this technology thing that was supposed to simplify your life but has largely only complicated it. We can't change the way technology is developing, but we can help you stay ahead of the curve. We plan ahead. We know the enemy. Always prepared for what's next, we protectively and proactively separate you from your foe on the battlefield. That's where the IT ninja stands. Concordantly, we're not just IT ninjas. We're your friendly IT ninjas. We get all this done, and we're pleasant to be around and fun to work with. There's only one IT group in the region that focuses entirely on dental healthcare IT support and that has the right connections with your regional Patterson Dental sales and support representatives. That's us. But don't take our word for it. Be sure to ask your rep who he or she recommends for providing IT support for your practice. We get how it all works. We're your dental clinic's best line of IT defense - both in plain sight and in the shadows. Don't settle for a typical IT partner. Choose Affinity. Choose the #ITninjas. Click here to learn more about this Affinity place where the	IT	ninjas	dwell.